This tutorial is both a continuation of WordPress News Theme and my WordPress Featured Content Tutorial. In this tutorial I’ll show you how to turn the previous html / css version of the featured content slider into a WordPress featured content plugin. You’ll learn how to make a meta box that allows the user to define the featured image they want to associate with their post. Part of this tutorial comes from the great book Professional WordPress Plugin Development. I wouldn’t have gotten through one of my problems without it. All of the code used follows the video. Leave any questions or comments below. Description: It displays a featured content slider on a web page. It was created to show how to create widgets and plugins. For it to function the Featured Picture must have the same name as the title of the post. That post also must be in the category named Featured. // user inserts file into post. I’ve been thinking you should make a series of videos about desktop application programming, which is something that almost nobody talks about. I’d do that and to a certain extent I have, but I don’t have a PC. Would you want to see Mac apps? 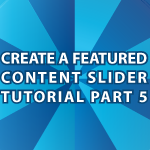 Seriously, thee’ best video I’ve ever seen on creating a Featured Content Slider. Thanks for the level of detail and cutting out all the other side chatter when explaining how to do this. I stumbled across your tutorial and watched them all and actually LEARNING something new and something i wanted to learn. Most people giving tutorials online tend to make the bad choice of playing music, getting off topic or not sticking to what’s at hand… the specifics. Thanks Derek. I am a fan of the site and have bookmarked it. What a time saver/ life saver this video series was. I can’t wait to checkout more. And yes…. ill be posting the same msg on your youtube so other know what gem these video(s) are. Thanks for your videos. I may be a bit behind, but I just followed your video and created an ‘Include Image’ metabox for a custom plugin. The plugin activates with “The plugin generated 5 characters of unexpected output during activation.”, which I cannot make much sense of. This usually indicates a missing opening or closing curly brace or a missing line-ending semi-colon. Did you copy the code directly from my site? Hi, thanks for answer me. I found the solution with the file .zip in the last tutorial, and now it’s working. But your tutorials are the best ! Keep going i’m learning a lot with you, thanks !